Chief Fred Willman is inviting the community to participate in a special event! 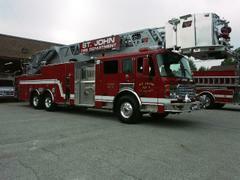 The St. John Fire Department will be holding their annual Open House this Sunday, October 4th from 11:00 AM - 3:00 PM at the St. John Fire Department. Fire Truck Rides, Vision Screening, Child ID's and much more will be available for you and your family.